One of my uncles flew in Wednesday from Texas and flew back out early Thursday morning, and in that short time, his presence inspired me in three very influential, perhaps life-changing ways. First, he bought my grandparents, his parents, two brand-spanking new vehicles. Yes, you heard that right! This has got to be the highlight of the month...winter...perhaps year. My grandma has always always had a dream of owning a little red sports car. Every one of us in the family knows this and has always known this. 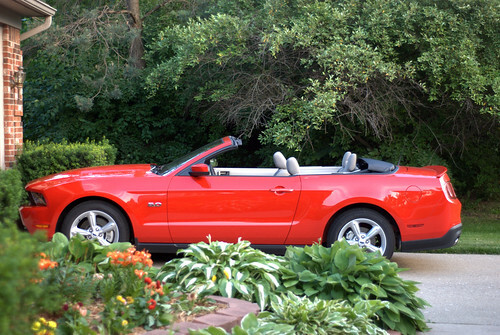 Well, how about a brand-new, lipstick-red, Ford Mustang convertible? I'm pretty sure that qualifies. I'm pretty sure that would also qualify as Socrates' version of the "perfect form" of little red sports car. My grandpa is also enjoying his fresh-from-the-mint Ford Ranger. To me, this has very little to do with the materialistic aspect of the gifts. It's about one man showing his deepest love, respect and gratitude to his parents. It is the most endearing, generous and lovely thing I have seen in a very long time. You will never meet two more deserving people of that level of love and respect. I have always said that it would be difficult to demonstrate the level of my appreciation to them for all that they do, but that I just hope I can strive to be as good a parent/grandparent as they have been to their progeny. And this experience has made me want to be the best mom I can be for my son every.single.moment. I want to emulate whatever it is they're doing so right. A mother's level of love for her children is an impossible pinnacle to surpass, and I want my son to experience every morsel of it. I will never suppress it or keep it undercover from him. And I hope that one day, he too will raise a family of all-around good people. Second, my uncle is an affluent businessman. He radiates an air of utter unerring confidence wherever he is. I only had the opportunity to visit with him for a few hours. But even in that length of time, his aura of dignity and integrity resonated with me. There is not a hint of hesitation in his step or passiveness in his manner. I am constantly trying to evolve and progress in my personal life and profession. And his presence and long-standing success infused me with a fresh surge of inspiration. Third, I didn't recognize the man when I walked in the door of the dealership. He has lost over 100 lbs and looks amazing. There's definition in his face and a sense of limberness in his body. I'm a complete sucker for a success story. I go scouting for them when I need a boost. And when a success story hits this "close to home" (really! ), it is the most potent of all. All I can say is, my grandpa has obviously passed on his diligence and self-discipline to other members of the family, providing other role models for me to revere and success stories to challenge me--and hopefully others as well!